When we think of the summer, we always think of spending time outside. There are few things better than a long summer day that ends with a barbecue in a backyard surrounded by a garden that’s overflowing with growth and flowers in bloom. It’s a season that never feels as though it’s going to end during its peak, yet one we know will slip away all too soon. But, we love how soirees, like weddings, ensure we delight in celebrating before fall’s colors and cooler temperatures arrive. Just like spring, summer and gardens go hand-in-hand. As a result, the summer boasts one of the greatest varieties of in-season flowers. And, these blooms are meant to be included in your wedding’s showstopper piece—your wedding bouquet. 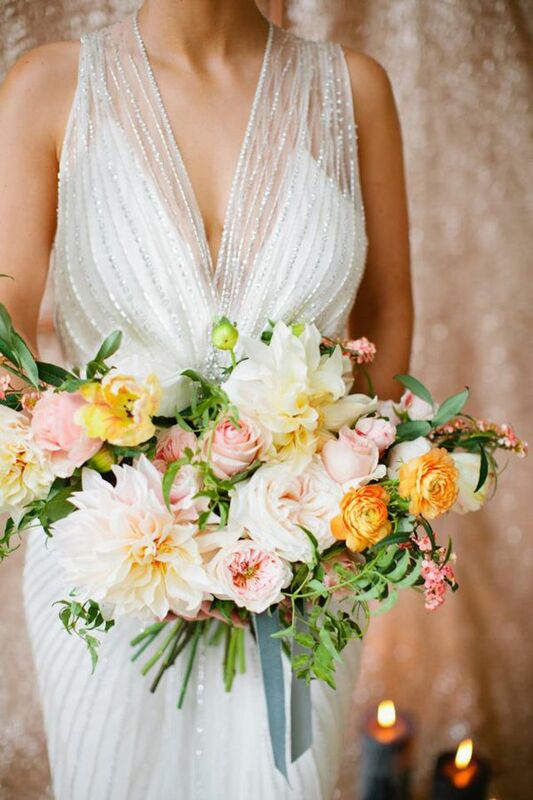 Whether you’re planning a seaside celebration or a modern soiree in a hotel, we’re sharing some of our favorite summer wedding bouquets. Continue to 2 of 16 below. We will never stop adoring peonies, and you can still experience these blooms in bouquets during the summer. Though it’s the tail end of their season, peonies still look fabulous with garden roses, poppies, and greens in this design by Candelaria Designs. The bright shades of pink and yellow are perfect for a summer wedding! Continue to 3 of 16 below. Sunflowers are one of the cheeriest blooms in season during the summer, and they’re wonderful for rustic style bouquets. This bride paired her sunflowers with bright roses and gerbera daisies, and we love how her bouquet and floral crown by Kittelberger Florist tied together for her soiree at her family’s property. Continue to 4 of 16 below. If you’re dreaming of carrying a wedding bouquet down the aisle that has a just picked from the garden feel, you must consider dahlias. Dinner plate dahlias in particular have a gorgeous, soft feel that makes them feel romantic. When paired with roses, ranunculus, and greenery, the look is bright and colorful while still feeling luxurious, just like this bouquet by Juli Vaughn Designs. We think we love dahlias even more than peonies. Continue to 5 of 16 below. If you’re hoping to carry a wildflower inspired bouquet down the aisle at your vintage or rustic wedding, look no further than Queen Anne’s Lace during the summer. This in season bloom has a light and airy feel. Tailor & Table joined Queen Anne’s Lace together with white poppies in this bouquet, and the bride and bridesmaids’ bouquets look fantastic when tied with mustard hued ribbon. Continue to 6 of 16 below. Zinnia season begins in later summer, and there are plenty of varieties of these blooms to include in bouquets. Here, Nicole Jansma Photography showcases a bouquet with honeycomb style zinnias in bold red, and it also features ranunculus, berries, and greenery. The color palette makes a brilliant statement. Continue to 7 of 16 below. Thanks to its bright colors, citrus is always a welcomed sight in summer wedding bouquets! Love This Day Events designed and planned A+J’s ranch wedding, and the team suggested that Andrea’s bouquet should feature citrus, astilbe, and plenty of greens. We think the look is a great combination of rustic and whimsical for an outdoor summer celebration. Continue to 8 of 16 below. To us, poppies are one of the best flowers to include in bouquets when you’re planning a whimsical wedding! They are in season during the summer, and they are most often found in shades of yellow, orange, and red. Because they are so interesting, we love how The Girl Floral designed this bouquet to solely feature poppies. Continue to 9 of 16 below. When we think of billy balls, we immediately imagine whimsical weddings! The bright yellow shade of this in season summer flower is so much fun, and the whimsy only continues in this design, captured by Alexis June Weddings, that features protea, greens, and more tied together with ribbon and lace. Continue to 10 of 16 below. Mackenzie and Will celebrated their wedding day on Nantucket, and they agreed they wanted to save money on their flowers. To achieve their goal, they opted to solely include hydrangeas. We love how Mackenzie’s bouquet features blue hydrangeas as well as ivory. The combination adds interest, offers a nod to a flower that’s famous for its presence on the island, and looks completely elegant and refined. Continue to 11 of 16 below. Succulents may be in season all year, but their soft green tones allow them to be a gorgeous option for summer wedding bouquets. Here, John + Moch Photography captured succulents with blush pink roses and astilbe at an elegant outdoor soiree. Continue to 12 of 16 below. If you’re searching for a budget friendly bouquet alternative, make sure to consider feverfew! The advantage of feverfew, which is featured in this bouquet from Rock My Wedding, is the blooms are clustered together to provide volume. Here, they are joined by cornflower, and the combination of colors is gorgeous for vintage or rustic weddings. Continue to 13 of 16 below. We’re always inspired by organic wedding bouquets, and what better way to make a bouquet feel organic than by including fruit? This bouquet by Alet Wessels features ivory roses and plenty of eucalyptus, and we’re so thrilled it also incorporates an in-season summer fruit—blueberries. Continue to 14 of 16 below. Similar to succulents, air plants are available year-round. However, here florist Weddings by Carly Ane’s paired an air plant with thistle and eucalyptus to create a more summer-focused look. If you’re planning an organic wedding or one in a greenhouse, this bouquet would add texture. Continue to 15 of 16 below. Raining Roses Productions and Kristen Weaver Photography teamed up to create this wedding inspired by the celebratory feel of Mexico. Here, bright magenta, orange, and yellow orchids are featured with gerbera daisies, greenery, and tropical flowers to create a whimsical look filled with energy. Continue to 16 of 16 below. Roses are beautiful in every season! Yonder House paired bright pink, peach, and light pink standard and Juliet garden roses together with deep red dahlias to create this garden inspired in season summer wedding bouquet. What Is a Tussy Mussy Bouquet?